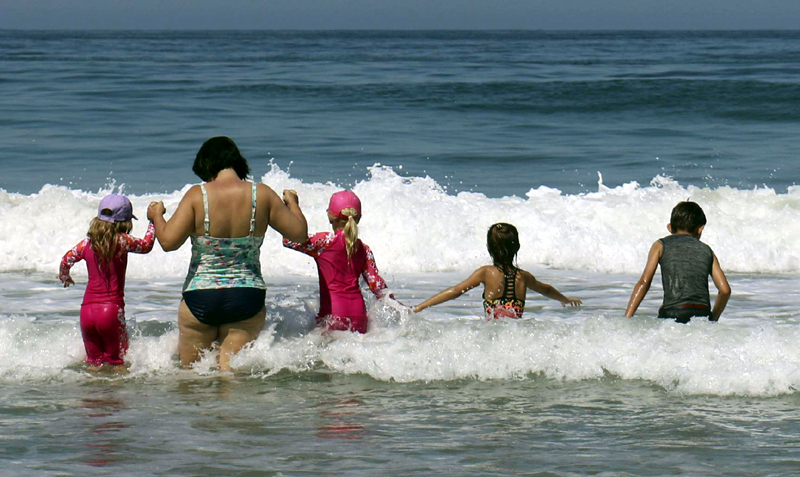 A woman and children wade into the surf in Hermosa Beach, Calif., as a record-setting heat wave hit Southern California Friday, July 6, 2018. Records for high temperatures for the date were being set all over the region, some before noon, with many in triple digits. Temperatures approached 120 degrees in parts of the U.S. Southwest on Monday, and forecasters said this week could bring the region's hottest weather of the year. [post_ads]Firefighters and city officials Monday morning distributed bright red cloth visors, hand fans and blue-colored cooling neckerchiefs to downtown Phoenix commuters, advising them to stay inside as much as possible. Parts of Utah were also issued an excessive heat warning with temperatures this week expected to approach 109 degrees (43 Celsius). The weather service said the warning for Utah's Dixie and Lake Powell regions will be in effect Tuesday through Thursday.